On behalf of the Southwest Idaho Medical Reserve Corps, Welcome, and thank you for your willingness to serve your community! The Medical Reserve Corps (MRC) coordinates the skills of practicing and retired physicians, nurses, other health professionals, and support personnel without medical training who are willing to volunteer during emergency situations and public health initiatives. Our goal is to recruit, train, and organize volunteers to help safeguard our community. Please share information about the MRC with your friends, families, and business associates. We understand that most people have busy schedules; therefore, the MRC has been designed to be flexible and allow for those other commitments that you may have. We meet once every three months for a business meeting and training session. We attempt to keep the meetings and training sessions under two hours in duration. One of the services we offer to our volunteers is the opportunity to take additional training as their schedule permits. Training opportunities are announced in our newsletter or can be accessed online. In case of an emergency, Just-In-Time (JIT) training will be provided at the emergency site that will be strictly event-oriented so that you will be prepared and ready to assist during that emergency. You have begun the process of joining an exciting and vital organization, offering you a variety of opportunities to serve your community. Please feel free to contact me anytime at 208-455-5324 or jeff.cappe@phd3.idaho.gov anytime you have questions or comments. 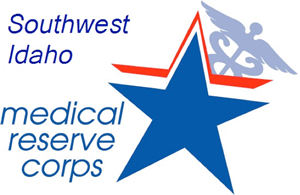 Once again, welcome to the Southwest Idaho Medical Reserve Corps!